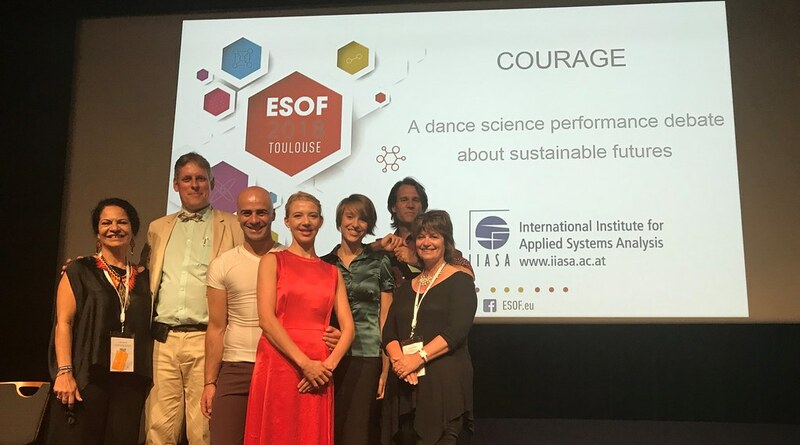 Composer Merlijn Twaalfhoven co-created the IIASA session: Courage – A dance science performance debate about sustainable futures by Gloria Benedikt who leads the Art and Science Project at IIASA, at the EuroScience Open Forum in Toulouse. He tells us more about how this merging of worlds can create new bridges between art, science, and societal issues. There I was, an artist invited to the largest conference on science and innovation in Europe – the EuroScience Open Forum, commonly referred to as ESOF. Amidst showcases and lectures about robotics, space exploration, and gene technology, I could share my ideas about the connection between art and science. This topic can easily become filled with abstractions or generalities. It is true that science and art are both about creativity and research, but is there a concrete way for them to find each other? Is there urgency to bridge these two worlds? The answer to both these questions is a resounding yes. Art and science are like children that always loved to play together. The worlds of both are filled with curiosity, take steps into the unknown, and embrace uncertainty and adventure. Both are not satisfied with the answers that are provided, and keep asking questions – obsessed with what is below the surface, beyond the horizon, and beneath the solid ground of our convictions. These two children have much in common, yet they have different eyes, they see things differently. While observing the same world, they pose different questions. Art and science have always learned and grown together, but over the last few centuries, they have started to grow more and more apart. We might say they have grown up. They each developed their curiosity and creativity into diligent practices and professional attitudes, and started to work within strict disciplinary boundaries. The playfulness and free experimenting sadly transformed into competition and a fixation on what they call “excellence”. Today, while global warming, inequality, digitalization, and migration bring instability and change to our societies and global mindsets, there is an urgent need for answers, reliability, and guidance. Leaders of all kinds, including artists that might influence the way we feel and scientists that might direct the way we reason, are pressed to give such answers. We all add our answers to platforms and channels of news, opinion, soundbites, and statements. It is a cacophony. A flood without structure. Nevertheless, do we actually know who is asking the questions? Is it the entertainers, talk show hosts, and commercial news media? Will we let the most dominant voices define the big questions of our time? Or can we bring better questions built on the observations, insights, and intuition of artists and scientists to the surface? We know what the big challenges in society are, and the urgent steps needed to prevent catastrophic global warming, societal polarization, and mass migration are well defined. But how do we, as curious, experienced, and highly trained artists, scientists, researchers, and explorers join forces to make the urgent and engaging questions become not just loud and clear, but part of everybody’s daily reality? Can we not just write or talk about warnings and concerns, but rather create and build questions that ask for a vision that is attractive and beautiful – a way forward that we can experience directly and that makes all of us want to make the world great again? A second step is to design ways to express this beauty and to imagine new possibilities. How can we show others the pride you feel? What is the value you get when you do not own a car? What does a stress-free moment sound like? A third step is to connect people to a changing and evolving reality in playful and challenging ways. What makes your pride contagious to others? How do we practice freedom from possessions? How do we build moments of stress-free time into a rhythm? 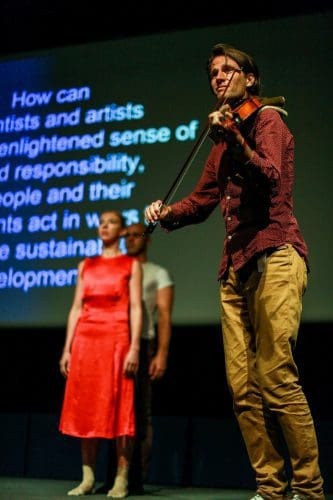 These are only a few examples of how art can expose beauty in urgent research topics, create forms of expression to give new ideas presence, and build living and changing structures where a new scientific/artistic mindset may flourish. What will be the laboratories in which we develop and explore new questions? When will these grownups – art and science – decide to approach each other again, remember their playful childhood, and fall in love all over again? It might be a fruitful affair and give birth to a new mindset that can help us face today’s challenges. Thank you: In writing this text, I received some valuable contributions from Gloria Benedikt and Anne Glover.